On October 15th Randolph College celebrated its twentieth anniversary with a fundraising gala in Toronto's Fairmont Royal York Concert Hall. 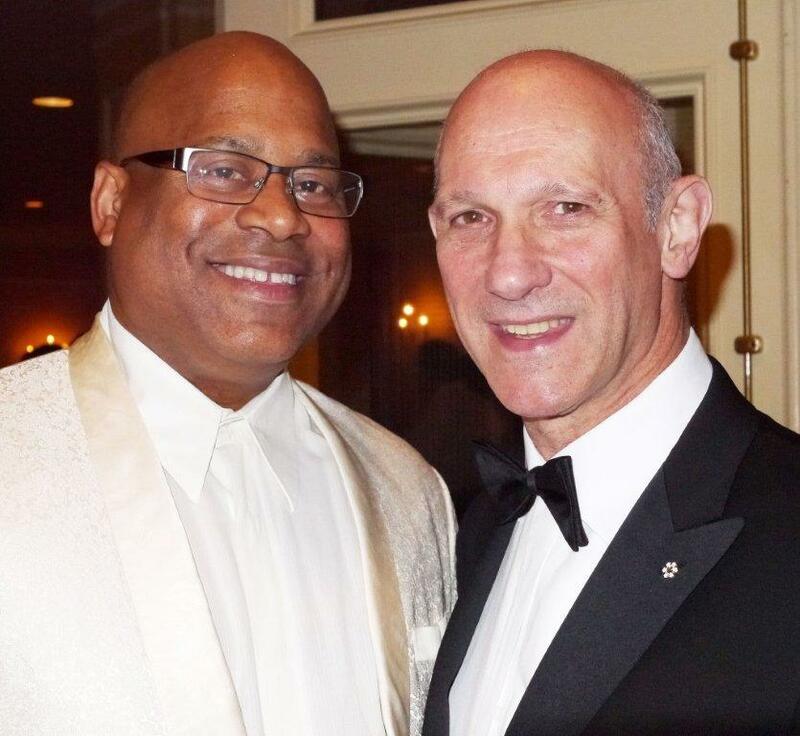 Over 200 people, including honorary co-chair David Mirvish, attended the dinner, auction and concert featuring over 150 students, alumni and special guests. The evening also celebrated the Bathurst Street Theatre's renovations and official name change to the Randolph Theatre. Another highlight of the evening was the presentation of the inaugural Gregory Hines Performing Arts Mentorship Award to Tara Young, artistic director of Cirque du Soleil's Michael Jackson: The Immortal World Tour. The late Gregory Hines, a friend of Randolph College founder George Randolph since the 1970s, periodically made surprise visits to the school to teach. He is buried in Oakville, Ontario, and, once a year, Randolph and other tappers pay tribute at his grave with stories and improvisation. Chances are, if you’ve gone to the theatre anywhere in North America lately, you’ve witnessed something of the Randolph College for the Performing Arts in action. Since its founding in a Toronto church basement 20 years ago, the performing arts school has produced two generations of theatre professionals modeled after the old Hollywood tradition of the Triple Threat – that is, a performer who, in equal measure, can sing, dance and act. First coined by the likes of Judy Garland and Mickey Rooney when they were kids performing in musicals some 70-years ago, the Triple Threat was a relatively unused term in Canada until George Randolph, an American-born hoofer, came to Toronto to literally shake things up. Trained at Alvin Ailey American Dance Theater, the former dancer with Les Ballets Jazz de Montreal arrived in Toronto in the 1980s at time when the city was being transformed into Broadway North. The big shows of the Great White Way were then crossing the border in record numbers, lured by local theatre impresarios like Garth Drabinsky and Ed Mirvish. Audiences were hungry for them, but the country didn’t have the manpower to sustain them. Theatre professionals here were either dancers or singer or actors. Rarely were they all three at once. They hadn’t had the training. Spying an opportunity, Randolph threw himself headlong into the void, eventually creating a signature Triple Threat program that is today the envy of much of the theatre world as he explained recently in conversation with Deirdre Kelly. Read on to find out how the Randolph College started and where it’s going next. It was a beautiful moment as the founding members of Theatre 20 blended with students from The Randolph College for the Performing Arts and showed just how effective our musical theatre talent is when they work together. The audience was visibly blown away by the calibre and quality of the performance. Then, in a stunning coup de theatre, the front third of the theatre suddenly stood up and revealed themselves as the student body of the Randolph College for the Performing Arts, who joined the Theatre 20 ensemble in a stirring rendition of Stephen Sondheim's "Sunday"
Theatre Reader: "A charming night in the woods... full of energy and passion ... a fantastic rendition of a Sondheim classic." Mooney on Theatre: "fabulously directed and performed"
Ontario Arts Review: "The Randolph College’s entry takes the famous Greek tragedy to a new level...From direction, to lighting & sound; to support cast, this enterprise deserves a full house." Mooney on Theatre: "off-the-chart level of energy and severe explosion of talent... for those who aren’t afraid to be entertained." NOW Magazine: "creative blocking, well-executed comedy and tight performances ... keep this adaptation of the film compelling throughout. NNNN"
Mooney on Theatre: "a really fun and interesting experience. Seriously don’t miss it." An interview with Ken James Stewart ('06) and fellow cast members of Great Expectations, now on stage at Neptune Theatre. "But it also provides magnifique vocal showcases for Tietzen and Irving on On My Own and I Dreamed a Dream, respectively, that are among the show's standout moments. In fact, musical fans are likely to get a sugar rush from all the showstoppers liberally sprinkled throughout Broadway on Argyle, with Tietzen soaring highest on Don't Rain on My Parade and Defying Gravity, although everyone makes the most of their moments in the spotlight." Review: "The Vaudevillians, a Class Act"
Paul Nolan (’99) received an Outer Critics Circle Award nomination for Outstanding Featured Actor in a Musical for Doctor Zhivago. An interview with Rui Amaral ('08), program director at Scrap Metal, a Toronto art space that has consistently presented challenging work by major contemporary artists. Read more. Adam Korson ('03), who received a Canadian Screen Award nomination for Best Performance by an Actor in a Continuing Leading Comedic Role. Adam's show Seed also received a CSA nomination for Best Comedy Program or Series. "Randolph College operates a very intense program in Stage Arts. It's demanding, both physically and mentally. It's not for everyone." "I'm impressed by you. I appreciate you doing this show for me." "Many of our performers have studied with you in the past and I look forward to us finding more members of our future casts from among your students." —David Mirvish, Mirvish Productions, Producers of Mamma Mia, Beauty and the Beast and Lion King in Canada. "In an era of advancing globalization it might seem anachronistic to discuss the emergence of a Canadian artistic voice. But facilitating the birth of that voice is precisely what animates instructors, at Randolph College." Copyright ©2017 Randolph College. All Rights Reserved.